Located down the ladder from the Steward’s Berthing is the Food Service Area, where the crew was fed three meals a day. Next to the ladder is the lower door to the dumbwaiter where the food was received. The heated steam table kept the food warm while it was being served. Cabinets on the outboard side of the compartment held mess trays, dishes, silverware, and condiments. At the forward end of the compartment is an ice cream machine, one of the few personal luxuries that the KIDD carried on her Pacific voyages. 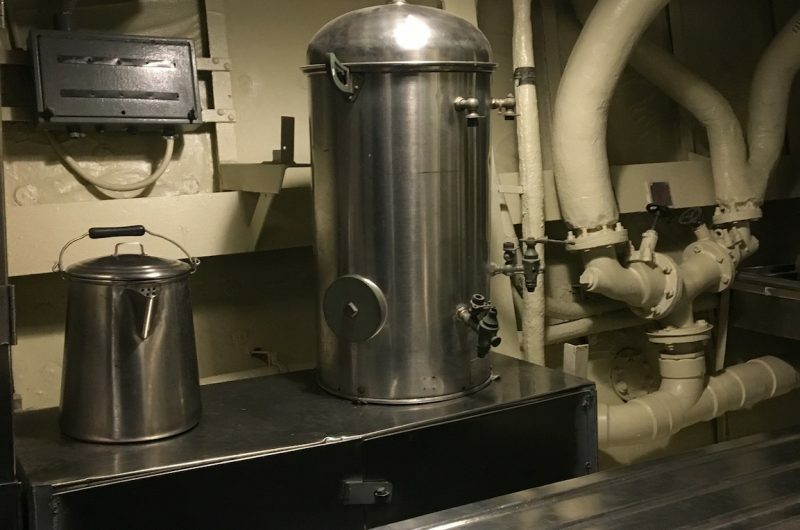 A passageway identical to the Food Service Area is located on the starboard side of the ship and located between the two in an ideal location is the Scullery. As pots and pans were emptied in the Food Service Area, they would be cleaned and sent back up to the galley. 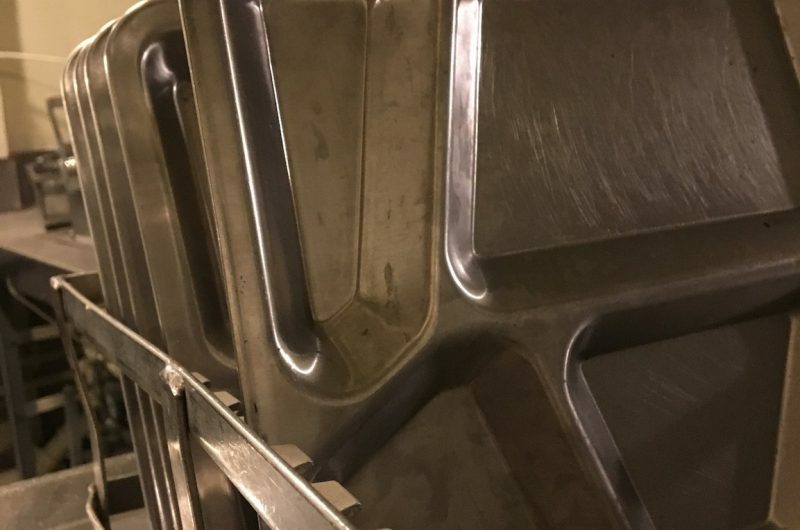 As sailors exited the messdeck on the starboard side and left their trays, the trays would be washed and returned to the stack of clean ones in the serving line on the port side. A 1940s-vintage automated dishwasher is located against the port bulkhead. Forward of the Food Service Area, the Scullery, and the Emergency Diesel Generator, you will find the Messdeck. This was the eating place and lounge for the enlisted crew. 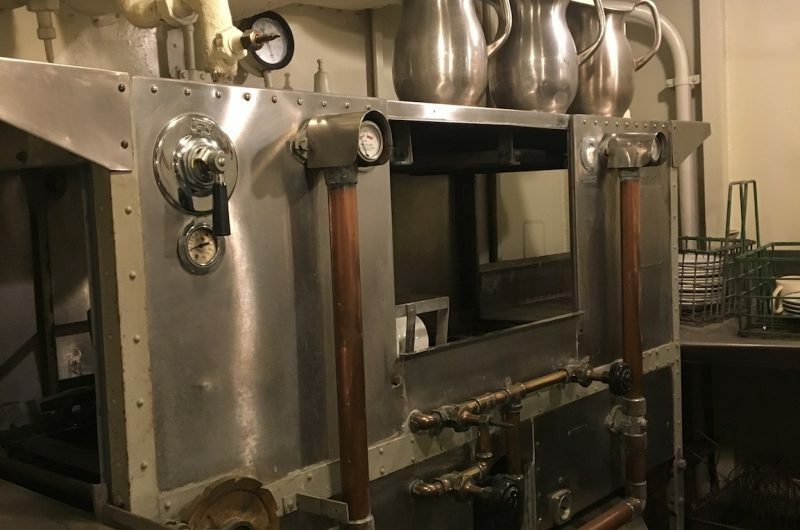 Sailors entered the compartment from the portside ladder, filled their mess trays in the serving line, ate at the tables, and returned their trays to the Scullery as they exited via the starboard side passageway. The line for this cafeteria-style service extended up both sets of portside ladders and along the main deck with the messdeck master-at-arms controlling the flow of sailors. The food was served and cleaned up by mess cooks, new men who reported aboard the ship fresh out of boot camp. The Navy was anxious for each enlisted man to “strike a rate,” or learn a skill such as gunnery, radar, boilers, or communications. To motivate the young sailor into rapidly learning a skill, six months of serving as a mess cook or mess attendant was a valuable incentive for the men to learn to do “something else.” This is especially true when you consider that these men had to carry hot food down the two flights of messdeck ladders to the serving line while the ship pitched and rolled around them. Sooner or later, they would spill something. Clean-up was never feared as much, though, as getting burned. There is a vast difference between the Officer’s Wardroom and what you see here. There are benches rather than individual chairs. There are no cushions, as they constituted a fire hazard. There are no dishes but rather metal cafeteria-style trays. Along the ceiling you’ll see the ducting for the ship’s only form of air ventilation. 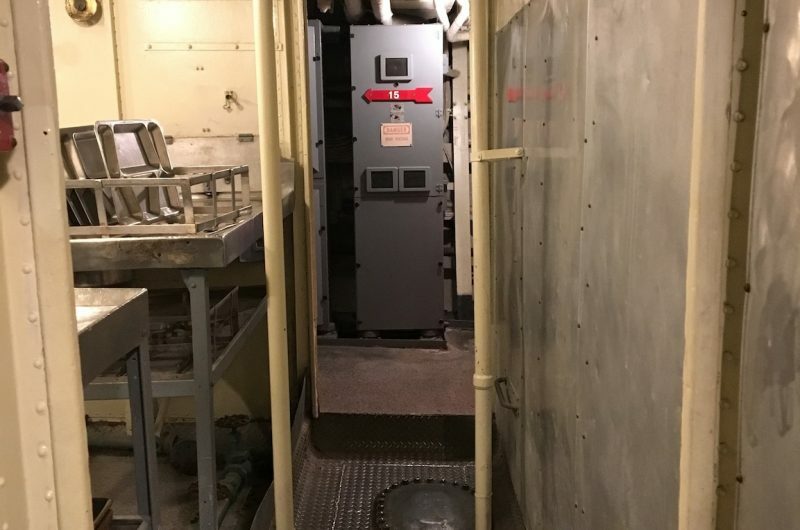 There was no true air conditioning, though you will see a unit toward the forward end of the compartment that was added in the early 1960s and replaced in the 1990s. The mess hall also served as a berthing compartment, with eighteen racks (bunks) along the outer bulkheads and hammocks sometimes strung between the stanchions. The bunks folded up against the outer bulkhead during meals, allowing sailors additional seating atop their fellow shipmate’s footlockers. 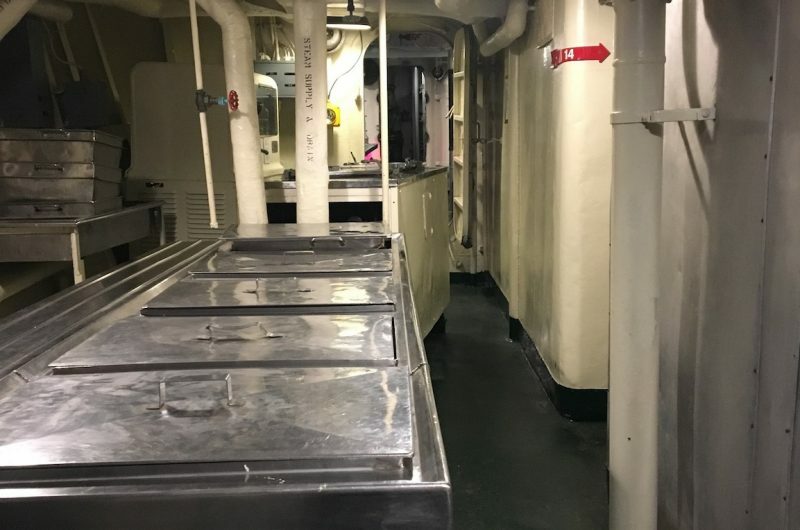 You can also see an open hatch leading beneath the mess deck to the reefer deck (the ship’s refrigerators). The edges of the tables are raised to keep the trays from sliding off during the pitching and rolling of the ship while at sea. Above the tables, you’ll see several long wooden beams. These are known as shoring timbers and were used to brace, support, or shore up damaged areas of the ship. The shoring timbers could also be used as a temporary patch in conjunction with the mattress covers you see on the bunks. These covers were fire-resistant and water-proof. Using both, sailors could form a latticework which could be dropped over the side next to a hull breach. The suction of the inflow of water would pull it into place and hold it there, forming a temporary and leaky seal, allowing damage control parties to effect speedy repairs.